Greedy PetSmart recently went back on its years-old "promise" not to sell rabbits in its stores. Like dogs and cats, unwanted rabbits are routinely dumped at animal shelters across the country because of simple math: There are too many bunnies and not enough good homes for them. Rabbits are social creatures with gentle natures and individual personalities. They also require special diets, stimulating environments (never an outdoor hutch! ), and veterinarians who specialize in their care. Caring for rabbits is not simple or easy, which is why bunnies are the third-most surrendered animals in the U.S.
Are dogs and cats next for PetSmart? Business-savvy PetSmart has for years ingratiated itself to animal protection and placement groups by allowing those groups to hold adoptions at its local stores. PETA's headquarters have heard from many of these groups that are deeply upset by PetSmart's shocking and irresponsible decision to ignore the rabbit overpopulation crisis, contribute to the needless deaths of rabbits in shelters, and contribute to the massive mill breeding of warehoused rabbits at "high-volume" breeding hellholes. PetSmart's decision to sacrifice animal welfare for cash comes as no surprise. During an undercover investigation at a PetSmart store in Connecticut-a store that has a Banfield Hospital right inside it and that PetSmart boasts of as having an "outstanding pet care team" and an "exceptional pet care record"-PETA documented that dozens of small animals had been deprived of adequate veterinary care and were slowly dying in the store's back room. The multimillion-dollar company is clearly unwilling to provide adequate basic care to the animals who are already bought and sold in its stores. Please join PETA in calling on PetSmart to immediately halt its irresponsible, deadly plan to sell rabbits while rescue groups are bursting at the seams with equally deserving homeless rabbits. Let the company know that you will not be setting foot in any of its stores until live animals are no longer part of the inventory. House Rabbit Society (HRS) chapters across the U.S. spend an average of 32,000 hours per year handling calls from people who no longer want to keep their rabbits as well as counseling the public on proper and humane rabbit care. A combined total of about 35,000 calls from people wishing to "get rid of" their bunnies pour into HRS chapters every year. HRS estimates that in the greater Los Angeles area, city shelters take in more than 1,100 rabbits per year and county shelters take in an additional 1,000, while other agencies in L.A. take in about 500 more. City euthanasia rates last year were 50 percent for rabbits. PETA also held a protest outside PetSmart Inc.'s north Phoenix headquarters today. (Thursday, Aug. 30th) There's no need for rabbits to be bred and sold while perfectly adoptable ones are being destroyed simply because there aren't enough good homes. I was appalled to learn that PetSmart has recently begun "test-selling" rabbits in its stores. In addition to adding to the serious problem of rabbit overpopulation, PetSmart is reneging on its commitment not to sell certain animals, including dogs, cats, and rabbits. If PetSmart is a company that, according to its own Web site, considers caring for pets "a moral obligation and responsibility," how do you justify contributing to the breeding and selling of bunnies (or any other animals, for that matter) - who suffer and must be euthanized in shelters nationwide, just as dogs and cats are - to be either moral or responsible? Rabbits are the third-most surrendered companion animals in the U.S., after cats and dogs. PetSmart's reckless decision will condemn countless homeless rabbits to death. Please halt your plans to sell rabbits. I will not shop at PetSmart, and I will be sure to tell all my friends and family members to do the same. Thank you for contacting PetSmart Customer Care. Please let us know if there is anything else we can do for you, and thank you again for contacting PetSmart Customer Care. Thank you for sharing your concerns with us regarding our test of dwarf rabbit sales in our stores. Your feedback is important to us and we're taking it seriously. This particular test only involves about 25 of our more than 900 stores and is likely to hold at this level until we have more information. We conduct in-store tests to get a real-world view of all the issues related to the sale of a particular pet before we do anything more. During this test we're collecting additional data and information related to breeding, health and care, associate training, retention, customer satisfaction, adoption vs. sales, population and all other aspects related to sale of these pets. We carefully test concepts to make sure the best interests of the pet, the Pet Parent and our business are served. We have received letters and phone calls from various animal welfare organizations including the House Rabbit Society as a result of this test. Because the HRS's letter addresses a number of concerns that also have been voiced by other groups and individuals, has been widely circulated, and serves as the basis for many of the letters we have received, we have posted both it and our response online at www.petsmartfacts.com. We encourage you to visit this site to read our response and for more details about this test. 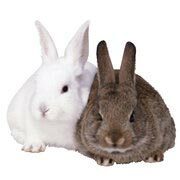 If we choose to expand the test or to eventually implement rabbit sales throughout our system, it will be only after we are convinced that we have a full understanding of all the issues and that we can provide this pet to homes in a responsible and ethical manner. Importantly, during this test we will continue as we have always done to partner with qualified local rescue organizations that adopt out rabbits and other pets in our stores. We expect nothing to change in this regard no matter what the test's outcome. We share your passion for pets and want to assure you we'll do what's right for our Pet Parents and their pets. Thanks again for sharing your concerns with us.